I generally enjoy life and am rarely disappointed by the happenings of a week, but I must say that the past 7 days have been better than most. This week was one of celebration and of getting to do some things that are really life-giving for me. The week began last Sunday with watching the NFL playoffs (always a joy) and the chance to preach for the first time at our new church in Kent. Over the past few years, preaching has become a true passion and something I always eagerly anticipate. I was blessed to be able to preach once a month at our church in Maple Valley, so I am excited to once again be on the preaching rotation at our new church home. The week's activities continued on Tuesday with the celebration of Mandy's 30th birthday. Since it was a weeknight, we saved the big extravaganza for the weekend and just the two of us went to a movie to celebrate. We saw the new Tom Hanks/Sandra Bullock movie 'Extremely Loud & Incredibly Close,' which was very good. It was nice to have a date-night out to commemorate this special occasion. 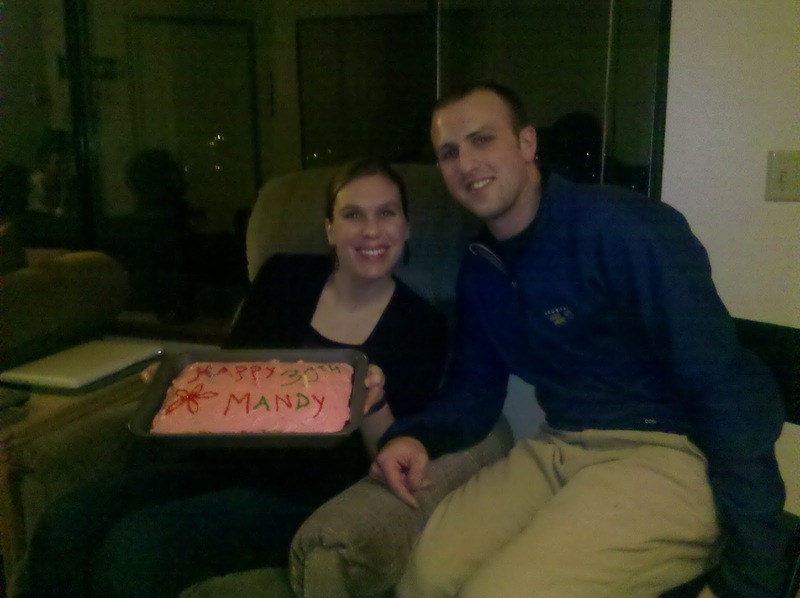 Mandy's birthday festivities continued on Friday evening when we hosted 10 of our best friends in our little apartment for a night of hanging out, playing games, and eating cake and ice cream. We had a great evening of laughter and fun with a special group of people we have shared life with over the past 4 years. What a blessing! The other aspect that made for a great week was the opportunity to enjoy the outdoors. The Pacific Northwest is never short of outdoor activities, and the mild climate means that many of these hobbies can be done year-round. Last weekend I was snow-shoeing in the Cascades, while this week was spent mountain biking in Seattle and Bellingham. David and I spent Friday afternoon honing our free-riding skills at the Colonnade Bike Park under the interstate near downtown Seattle. And then the next day, David, Tyler, and I rode great, technical singletrack at Galbraith in Bellingham. So fun! I did take a pretty nasty fall on Friday at the Colonnade, however, which served to remind me that I, myself, am coming up on my 30th birthday and might need to be a little more careful in the coming years to avoid any serious injuries. All in all, a great week. Here's to many more like it!